Searching for an American Curl? The American Curl takes its name from the distinctive backward curl of its ears. This gives this feline a perpetually perky, bewildered look. Originating in the US, this feline has been called the Peter Pan of cats because its personality stays kitten-like throughout its lifetime. It is playful, sociable, good with children, and easily bonds with humans, thus making it a good family pet. This dog-like kitty can enjoy a game of fetch and follows its human around. Although a robust breed, the American Curl needs to be picked up with care to avoid damaging its ear cartilage. A highly adaptable pet, it is not as talkative as other breeds and is also not demanding. It is a low maintenance cat as its coat only requires minimal grooming. Do you plan on getting an American Curl? Here is a brief background of this unique-shaped ear cat with a kitten-like attitude, often referred to as the Peter Pan of cats. This friendly feline’s ancestry can be traced to a stray cat named Shulamith. In 1981, the black, long-haired stray appeared in the garden of Grace and Joe Ruga of California, USA. After feeding it with bowls of food, the kitty moved in with its benefactors. Shulamith went on to give birth to a litter of 4 kittens, of which the local tomcat was the father. Two of the kittens had their mother’s curly ears. A geneticist later acknowledged that the curled ears were due to a dominant gene. The original cat continued to be bred with other stray cats and produced kittens of various fur lengths, colours, and coat patterns. Two of Shulamith’s offspring were given to Nancy Kiester, a former dog breeder. She showed them to a Scottish Fold breeder and cat competition judge Jean Grimm, who never saw that kind of cat in the past. Grimm then collaborated with Kiester and the Rugas to create the breed standard for this feline. Two years later, feline fanciers began to breed this type of cat selectively. The American Curl was bred with non-pedigreed house cats to prevent hereditary health issues. The Cat Fanciers’ Association later awarded this breed championship status in 1993. Today’s American Curls are all descended from Shulamith. Although acknowledged by the FIFe and TICA in the UK, this feline is not yet recognised by the Governing Council of the Cat Fancy (GCCF). It is also not commonly seen in the UK and there are very few American Curl breeders in Britain. The American Curl is a medium-sized cat that weighs anywhere from 7-10 lbs. It has a rectangular body and a luxuriously plumed tail that tends to be as long as its body. Its most distinctive feature is its tufted, curled ears, which have been likened to those of a lynx. American Curl kittens are actually born with straight ears, which start to curl in 3-5 days. The curling continues until the kittens are four months old, which is when it is permanently set. The breed standard is a 90-180 degree curl, no more and no less than that range. The tightest curls are the most desired ones. This feline’s eyes are large and round and may be of any hue. The eye colour usually matches its coat pattern and colour. 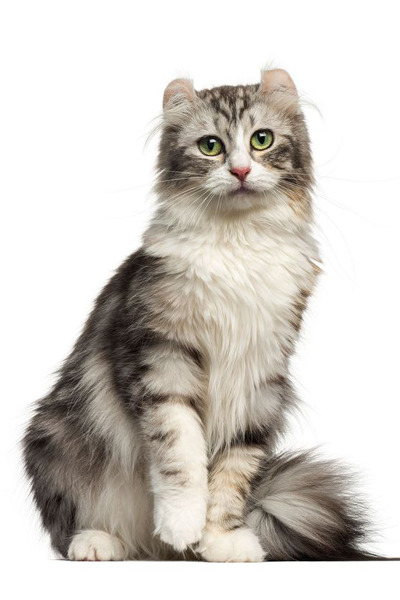 This cat breed’s coat can either be short or long-haired. It also comes in a variety of colour combinations due to its diverse ancestry. Friendly, playful, gentle, and people-loving, the American Curl is a delightful feline that retains its kitten ways throughout its lifetime. Its dog-like personality makes it a wonderful family cat. It enjoys playing fetch and likes to follow its humans around. However, unlike other breeds, it is not demanding or talkative. It may greet owners with an affectionate head bump to make its needs known. A genial breed, it loves children and can live with other animals. It likes to look down from high places and also stay on one’s lap. Being an intelligent and curious kitty, it likes to engage in play and get involved in other domestic tasks. Being a very sociable cat, the American Curl does not like to be lonely, so it should not be left alone for long. Its ears should not be fiddled with, and playtime with small children should be avoided or closely supervised. The American Curl cat should be fed good quality food that fulfils its nutritional needs. It should be consistently fed the same food. If there are changes to its diet, those must be done gradually to prevent digestive upset. Provide small frequent meals to the American Curl to keep it healthy. The portion should depend on its weight, age, and activity level. Generally, the protein content should be at least 25% up to 35%. Fat must only be limited to 20% of its diet. Fibre content should range between 2% and 4% to enable this feline to pass food (and hair) efficiently. The rest of its food’s nutritional content should also include a minimal amount of vitamins and minerals. The American Curl’s lifespan ranges from 14 to 20 years. This cat is known for being a healthy breed. Not only does it look sturdy, it is truly a hardy feline. In fact, it is not known to have any genetic issues (at this point). Despite this, it is always recommended to get American Curl kittens for sale from reputable breeders. A well-bred American Curl kitten can cost £600-£900 to acquire. However, finding one in the UK could be a challenge as there are very few breeders of this feline. Only 2 have been noted to be breeding this kitty in the country. On average, the monthly costs of caring for a cat can reach £70. This rate includes vet bills, pet insurance, litter, food, and toys. Annually, expect to spend £840. For its lifetime (14-20), the costs of ownership may range from £11,760 to £16,800. This does not include the costs of neutering and microchipping. Is an American Curl Right for You? The American Curl is sociable and loves human company. Its dog-like traits make it a great family pet. Being of sturdy health, this feline is ideal for those who do not want to be weighed down by vet treatment costs. Its coat does not require much grooming. The American Curl is a social breed and does not like to be left alone. It is hard to find in the UK as there are very few breeders. The information, including measurements, prices and other estimates, on this page is provided for general reference purposes only. Use caution and seek the advice of qualified veterinarians and/or professionals when attempting anything related to buying or caring for a pet. Rabbit Teeth Grinding- Is it Normal? What Happens to Rabbits After Easter?